They began their preparations the night before, getting ready to perform the final acts of care for their beloved Jesus, just as they had been providing care for him while he traveled and taught. They had established roles in the community, and they must have really mattered to his inner circle or, since they were women, we would know nothing at all about them. We have the advantage, every time we hear this story, of knowing how it ends, with an empty tomb, and some number of men or angels declaring that Jesus has been raised from the dead, some scene indicating divine action. Two out of four gospels give us an appearance by the risen Lord to the women, but this is not one. Here and in Matthew, they are instructed to go, and tell Peter and the others the good news of the empty tomb and a future reunion in Galilee. They began the night before, ready to do things they knew how to do, things they already understood, things that even in the midst of terrible grief they could rely on themselves to carry out, the rituals attendant on a death. Now that they had different orders, how did they respond? When you began getting ready last night, if you’re like me, you were thinking about the rituals now attendant on Easter Sunday: laying out clothes for church, putting together baskets for little ones, making note of who might appreciate a phone call or a text, cleaning up the kitchen to make way for holiday cooking, or mulling over whether to accept the general invitation to join the choir in singing the “Hallelujah” chorus at the end of the service. They began the night before, ready to go through the motions, because that was what they knew how to do. Maybe, like the women, you woke this Easter morning grieving for yourself, or for the world, but knowing you could manage these rituals, even so. As much as we might like to relieve the pressure of this disappointing ending, maybe we ought not resist it. Maybe we could just sit with it for a minute, having sympathy for these women torn by witnessing the worst news and now stunned to be shown that the story is not over. How were they supposed to explain a missing body and a promise that Jesus would meet his friends back in Galilee? I don’t think it should surprise us that the women couldn’t follow their new instructions right away. How well do we handle it when God wants more from us, when God wants things for which we did not know to prepare? How ready are we for God to be waiting for us on familiar ground, with unexpected work for us to do? I’m 56 years old, and my world view has been changed drastically in the past ten years. I don’t count on the things that I used to deem reliable, nor do I hold to the same standards I was taught. The things I prepared to do and be no longer seem applicable. I have to believe that is good news even if it scares me a little. They began the night before, but the women woke to a world that had changed forever. May it be so for us this Easter day. 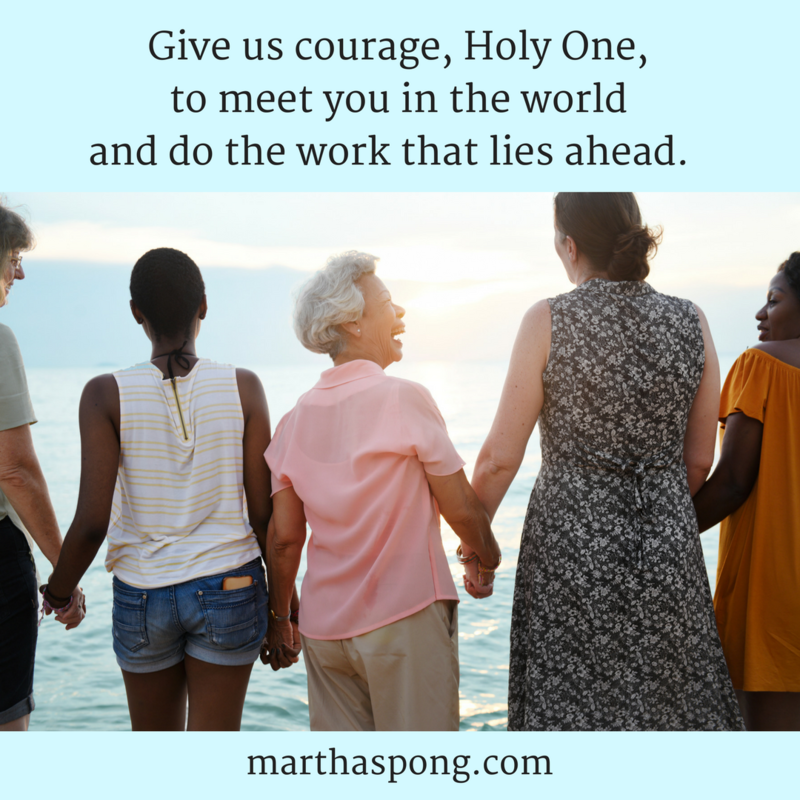 Give us courage, Holy One, to meet you in the world and do the work that lies ahead. Amen. Happy Easter! I’ve reading and blogging about Mark for Lent and using the Common English Bible because it messes with my expectations of familiar passages. I also sometimes refer to NRSV-based resources including The Jewish Annotated New Testament, and the New Interpreter’s Study Bible, as well as the online Greek interlinear Bible. You can find links to earlier posts here. Come back tomorrow for the alternate ending to Mark.